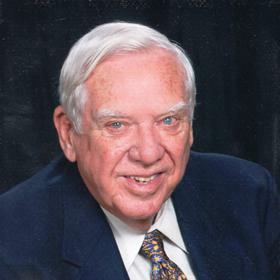 Harold Edward Bowman, MD, age 93, of Muskegon, Michigan, died on February 1, 2019, in his home surrounded by his family. Hal was born in Attica, Indiana, on November 5, 1925, to Mode and Virgie Bowman. He is the older brother of Esteleen McDonald. At the top of his class and always over-achieving, he started his undergraduate studies at age 16 at Indiana University and went on to medical school also at Indiana University, where he was a proud member of Acacia Fraternity. 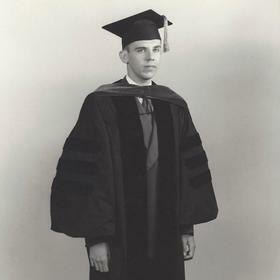 He was 22 when he graduated from medical school in 1948, just after the end of World War II. He served in the Naval Reserves for two years following medical school. He married Sally Ann Merica in 1952, and they had three children. They moved from Indianapolis to Detroit for his residency in pathology at Henry Ford Hospital. He went on to work at St. Mary’s Hospital in Grand Rapids, Michigan, where he was Chief of Staff during his tenure as well as Director of Laboratories. He oversaw many other laboratories in Michigan, including Ferguson-Droste-Ferguson Hospital, Mary Free Bed Hospital, the State of Michigan Corrections Department, and the Civil Service Commission. In 1981, he left Grand Rapids to rebuild and expand the laboratory capabilities of St. Lawrence Hospital in Lansing, where he also served as the Associate Chairman of the Department of Pathology at Michigan State University College of Human Medicine. He was a Governor of the College of American Pathologists, President of the College of American Pathologists Foundation, member of the Executive Committee of the American Cancer Society and president of the Kent County Medical Society. He was involved in many other professional organizations. After retiring from St. Lawrence Hospital and teaching, he moved to the lakeshore in Muskegon in 1994. Sally Merica Bowman preceded Hal in death in 2005. In addition to his remarkable career as a pathologist, Harold was a lifelong philanthropist. He was a major supporter of St. Paul’s Episcopal Church, the Muskegon Art Museum, West Michigan Symphony, Mercy Health of Muskegon and the Saint Mary’s Foundation, where he was one of the founding members. He was a consummate historian, avid reader and collector of antiques. Harold is survived by his three children: Karl Frederick Bowman (Gale) of Raleigh, North Carolina, Eileen Bowman Stoffan of Muskegon, Michigan, and Kent Edward Bowman (Cherie) of Detroit, Michigan. He is also survived by 10 grandchildren and 4 great-grandchildren: Karl Frederick Bowman, Jr. (Melissa) and their children Emma and Cameron, Alexander Philip Stoffan, Merica Stoffan Dobry (Eric) and their children Margaret and Thomas, Brooks Edward Bowman (Jennifer), Peter James Stoffan, Christian Edward Stoffan (Kristy), Sean Edward Bowman, Robert LeRoy, Christina Marie Bowman and Derek Edward Bowman. He was preceded in death by his son-in-law, Philip Michael Stoffan. Thursday, February 7, 2019, Noon with visitation from 10:00 am till Noon at St. Paul’s Episcopal Church on 3rd and Clay with Rev. Michael Fedewa officiating and assisted by Rev. Elsa Pressentin. MEMORIAL: In lieu of flowers, please consider memorial contributions to St. Paul’s Futures Fund, Saint Mary's Foundation, or Harbor Hospice Foundation.